Confession: I am a scarf addict. When I saw the invite to participate in a blogger Scarf Week, I couldn’t resist! I have had a habit lately my entire life of way over-committing myself, so I reigned myself in and only signed up for one day. But my how I would have loved to have the time to crank out five fabulous scarves! Have no fear about a shortage of scarf inspiration, because once you check out my beautiful–and totally doable–brush stroke scarf tutorial, you can see dozens more creative scarf projects. Because while eyes are glued to TV screens full of shark footage this week, blogland is being flooded with killer scarf inspiration. Here are the themes for the second annual Scarf Week. 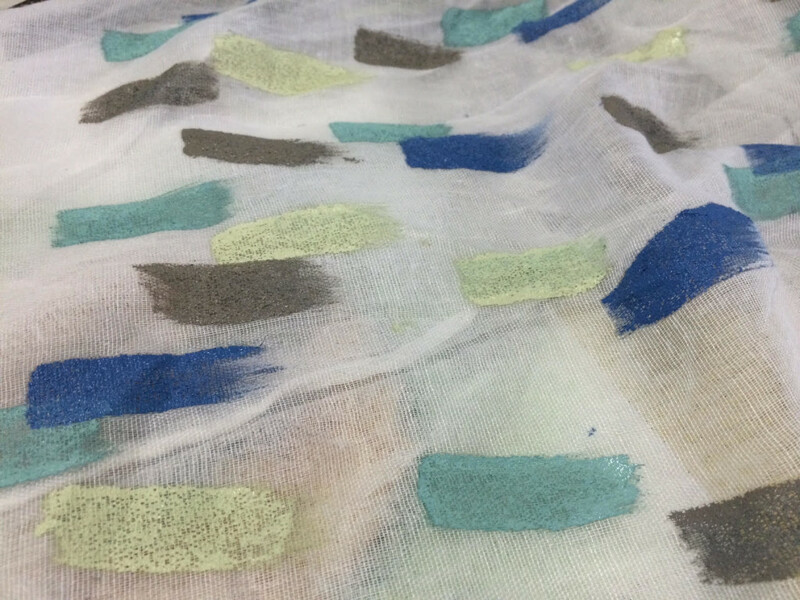 Today is dyed, painted and stamped scarf day! 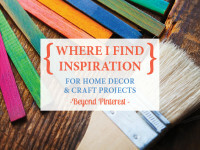 You know all of those intricate, impressive, totally over-the-top DIY projects you see on Pinterest? Well, I’ll tell you right now that this is not one of them. 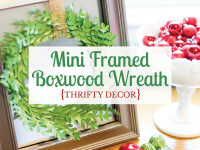 This, my friend, is a totally affordable, simple project that you can complete in an hour. What’s that? You say you’re not crafty or artistic? Well then, this project is perfect for you! I insist you give it a try. I recently bought an array of blue/green paints that are all of my favorite shades of color, so I decided I would use those paints for my scarf since I had them on hand, they match my entire wardrobe, and I was aiming for a cheap project. Plus, I was in a hurry, which means I needed to avoid the paint section because that always equates to an hour of my time drooling over the color options, delighting in each of the clever paint names, and lamenting over which color will be the perfect one. So, I stuck with my tried and true paints. Since this project takes very little paint, it would be a good way to use up those last drops of paint in your bottle. And you could use as many or as few colors in your scarf as you’d like. If I was going to be impressive, I would have found some white fabric and sewn a blank scarf. But, I was feeling lazy. I went to Walmart to see what sort of scarf selection they had, and I was ecstatic to find sets of two scarves for $5.00. Yes, you read that right. 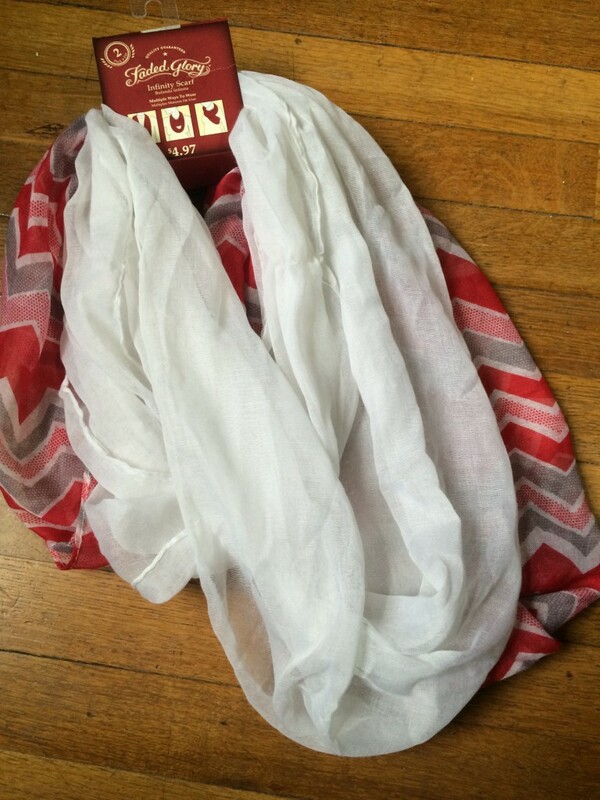 TWO SCARVES for $5.00. One was a fun pattern, but the second was a blank white. Perfect! Go to Walmart right now and pick one up. Seriously, the Walmart in my small town is super tiny, so you’re bound to find a cheap white scarf if you have a larger store with a bigger selection. Next, you will want to prep for painting. I recently bought a nifty bottle of fabric medium, which mixes with paint to create a more runny paint meant for fabric. You can find fabric medium at any craft store. If you’d rather, you could certainly use actual fabric paint. Whatever floats your boat. The paint I used was actually chalk paint. It dried a bit stiff, so I need to experiment next time with mixing in more fabric medium. Or perhaps I should have followed the instructions and used acrylic paints as the bottle stated. But for a scarf, it’s no big deal if the splotches are a bit stiff, especially since we’re not covering the entire thing in paint. I made about a tablespoon of each color of paint. 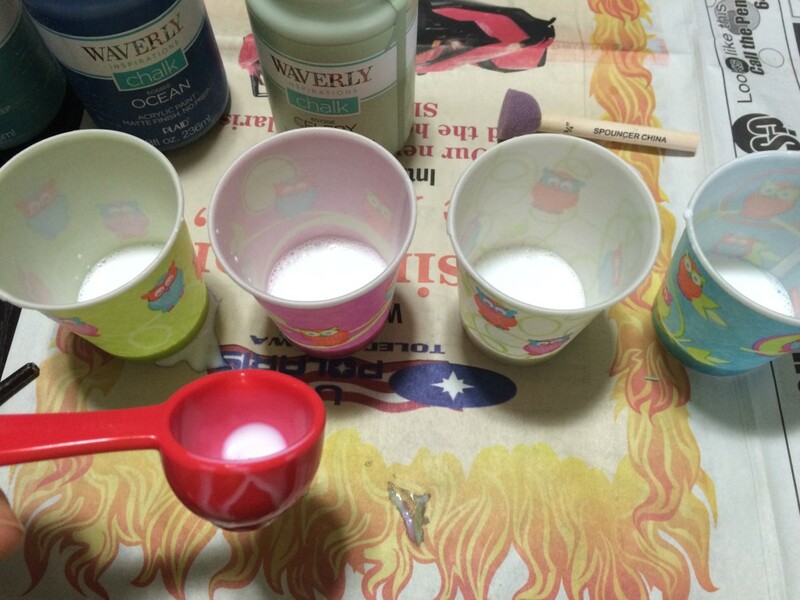 Dixie cups worked great to mix them in! Once your paint is ready, get out a plain ol’ paintbrush and cover your surface with newspaper. Now’s the fun part! You just start brushing paint on randomly! I’m serious when I say you can’t mess this up. Make your strokes as long or as short as you like. Since I used an infinity scarf, it didn’t lay out completely flat so I just painted my scarf in sections. Because I was impatient, I busted out my hairdryer and used the cool setting to dry the paint after I finished each section. Blasting the cool air on it for a couple minutes helped to set the paint so it does’t rub off onto the rest of the material. Because the fabric is thin, my paint leaked through onto my newspaper, so I laid out a fresh layer of newspaper before painting each section. P.S. 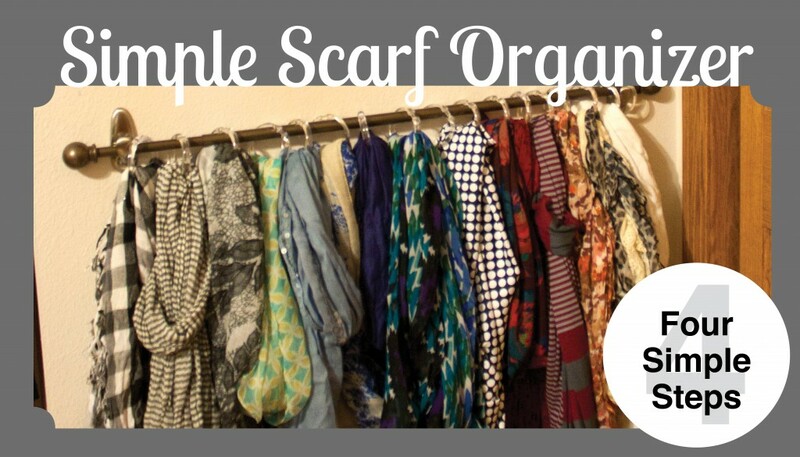 Looking for a way to organize all of your scarves? Check out my blog post about how to make an Easy Hanging Scarf Organizer in one hour for under $20. To access all 5 days of Scarf Week, visit our co-coordinators, Lauren from The Thinking Closet and Vanessa from Tried & True. They’ll be updating their posts with the clickable collages as they go live this week. 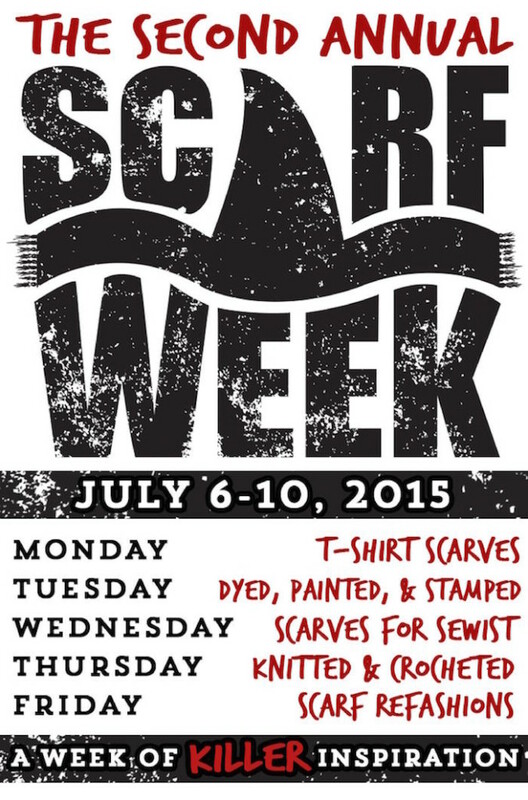 And you can also follow along with our hashtag, #ScarfWeek2015. It’ll be wave after wave of killer inspiration, no fish-bones about it! Awesome! Thank you for featuring my project. I will most definitely be dropping by your party tomorrow. I cannot believe you made that! It just looks so beautiful and I love your colour choices. Thank you so much for visiting! I’m so proud of how it turned out, so your comment means a lot. Aren’t blues just so pretty? That turned out so awesome, I love it! Thanks so much, Elena! I’m so happy you stopped by for a visit. I love this scarf and you used some of my favorite shades of blue. $5? really? 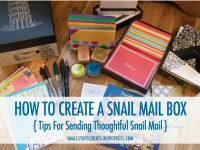 I’m heading over to Walmart tomorrow, I’d love to make one like yours:) Thanks for sharing your tutorial! Pinning & sharing! Have fun making your own! It’s so easy and so cheap, it’s a must-do 🙂 Thanks for visiting! What is it about scarves that makes us hoard them?! I seriously adore this tutorial and will be adding a blank white scarf to my shopping list. Thanks so much for joining Scarf Week 2015! Aww, thanks so much Vanessa! Scarf Week has been a lot of fun. 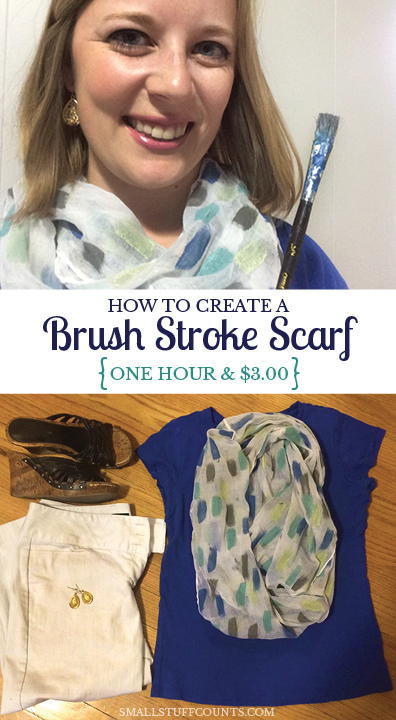 I hope you create a fabulous brush stroke scarf of your own. Thanks for stopping by! 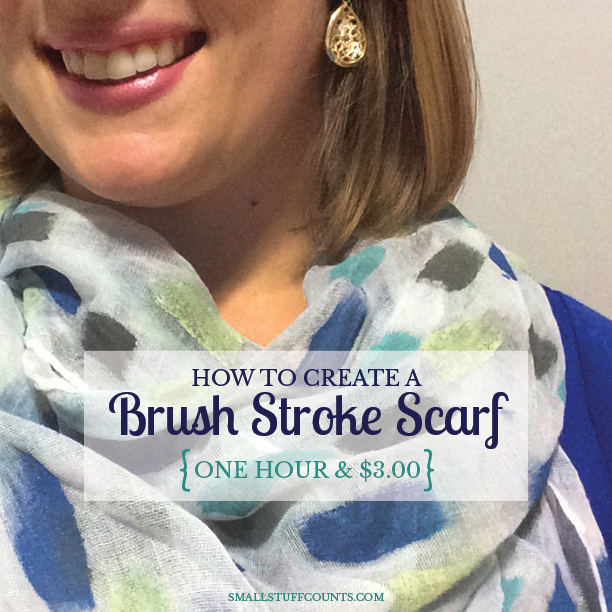 Your brush stroke scarf turned out SUPER cool. I love the brush stroke look, and you’ve convinced me that this would be such an easy and do-able project. Way to go on finding that Walmart deal, too! Can’t beat $5 for two scarves. No siree. Off to pin this gem! Haha, yes I am wearing my most favorite scarf in my profile pic! You caught me, I’m a total scarf addict. Thank you so much for organizing Scarf Week. Thank you, Ginger! I had a lot of fun making it. Such a cool post and your scarf looks AWESOME!! 🙂 Nice work! 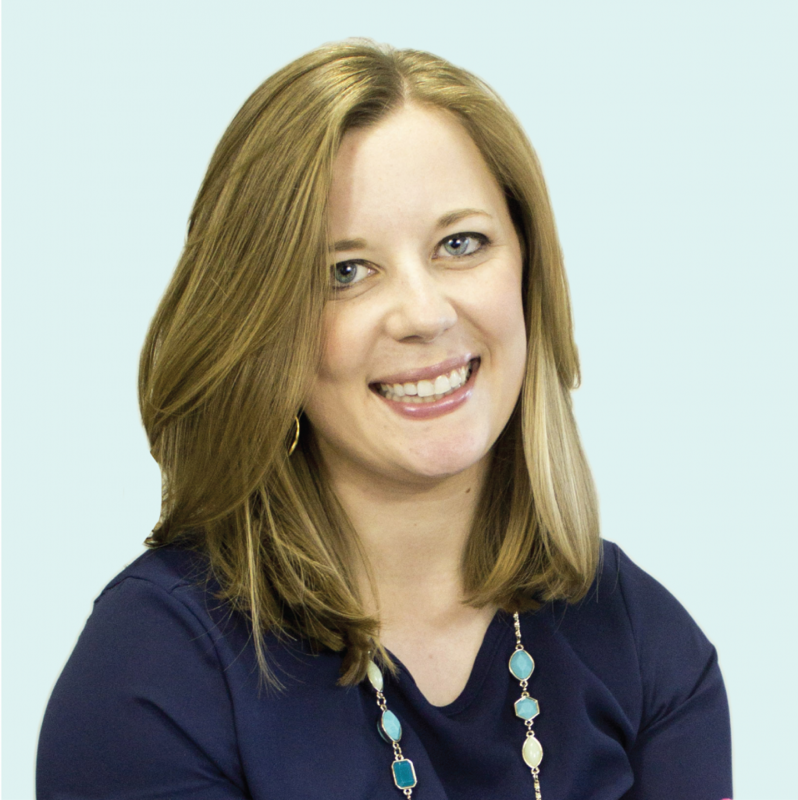 I’m really enjoying your blog posts, hope you are doing well! Thank you! 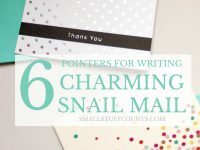 I have been having so much fun on craft projects lately, and it’s even more fun to get to blog and share them with others. Thanks for stopping by and reading. Thank you! I’m so glad you were able to stop by and visit me. I’m very happy with how my scarf turned out, and the others all look amazing as well. Looking forward to visiting all of the others participating in Scarf Week!